Collaboration is not a foreign concept in the field of social work. All practitioners know that to effectively deliver services, social workers cannot be a team of one. Many other professionals are involved not only in clients' lives but also in their health (physical, emotional, and mental) and well-being. However, in education, the world of social work (and many other professions) can seem more like a silo than a part of an interconnected system. Separate buildings on campus, separate professors, and seemingly separate educational goals can create a feeling of isolation. But how it appears isn't necessarily how it is or what it should be. The Council on Social Work Education (CSWE) recognizes the importance of collaboration and, in an attempt to further interprofessional work, became a member of the Interprofessional Education Collaborative (IPEC) in early 2016. CSWE is a nonprofit association that already focuses on collaboration. With more than 2,500 members, the organization connects schools and other educational institutions, professional and social service organizations, and individuals with the goal of ensuring that the best, most effective social work education is available to those who seek it. In an attempt to do just that, CSWE provides accreditation for both baccalaureate and master's social work education programs. It is a perfect fit for the IPEC, a cooperative created to enhance patient-centered care. "In 2009, six national associations of schools of health professions formed a collaborative to promote and encourage constituent efforts that would advance substantive interprofessional learning experiences," says Richard W. Valachovic, DMD, MPH, president and CEO of the American Dental Education Association and president of the IPEC. "The goal was, and remains, to help prepare future health professionals for enhanced team-based care of patients and improved population health outcomes. "The collaborative, representing dentistry, nursing, medicine, osteopathic medicine, pharmacy, and public health, covered an expert panel of representatives from each of the six IPEC sponsor professions to create core competencies for interprofessional collaborative practice to guide curriculum development across health professions schools," he says. In 2009 the educational associations represented were the American Dental Education Association, the American Association of Colleges and Pharmacy, the American Association of Colleges of Nursing, the Association of the Schools and Programs of Public Health, the American Association of Colleges of Osteopathic Medicine, and the Association of American Medical Colleges. They remain in the collaborative today. In 2016, the IPEC invited nine new members to join, opening the door for CSWE. The IPEC chose to expand its membership in an attempt to further its reach, recognizing the continually evolving world of health care. "The future of health care is clearly going to be much different than it is today," Valachovic says. "It will be more focused on prevention, based on a culture of health, financed in significantly different ways, and delivered in models that are unlike what we see today." With that in mind, health professionals will need to not only work closely together but also be trained closely together. "Professions like social work will take on a much more prominent role in this new model of delivery of health care," he says. "We need to start engaging all professions who are involved in the care of individual patients and indeed of populations of patients to become more collaborative to meet the triple aim of improving the patient experience of care, improving the health of populations, and reducing the per capita cost of health care." For its part, CSWE has the same aim and understanding, and has known that IPEC membership would be valuable for some time. "Acceptance into the IPEC was something that I have been working toward since the first year I began my position at CSWE in 2012," says Darla Spence Coffey, PhD, MSW, president and CEO of CSWE. "From the beginning, it seemed obvious that social work should be involved in the conversations about how to prepare health care practitioners for interprofessional collaborative practice," she says. "However, in order to do that, I found myself needing to educate other health care professions about the role and value of social work in health care and in interprofessional education and practice." The path to interprofessional collaboration began with CSWE's membership in the Federation of Associations of Schools of the Health Professions, another professional cooperative consisting of 14 member organizations. By joining this association, Coffey says she was better able to inform other health professionals about the value of social work. "It also helped me to introduce a broader understanding of health that is consistent with social work—including healthy relationships and healthy communities." Coffey adds, "Becoming a member of the IPEC means that social work is not only integrated into the thinking about interprofessional educating but [also] able to play a role in setting the agenda for it as the future unfolds." Now that CSWE is one of the nine new institutional members of the IPEC, what does that mean? "Membership in the IPEC provides associations with opportunities to be active participants in the development of policies related to the emerging areas of interprofessional education and collaborative care, participate in faculty development and other programs for their individual members, contribute to and benefit from the rich resources that are being developed in these areas, and benefit from networking and other collaborations that will enhance professional relations in a changing health care environment," Valachovic says. Coffey agrees, adding that she and CSWE Board of Directors Chairperson Barbara Shank, PhD, MSW, attended and participated in the inaugural meeting of the IPEC. The meeting alone generated several ideas about how interprofessional education could be furthered, "including developing assessment measures for interprofessional education, developing ways to ensure that all health professionals are prepared to address social determinants of health, promoting health and wellness of health professional students, and more," she says. Already, these ideas are taking shape. On July 11, the IPEC announced an updated version of its Core Competencies for Interprofessional Collaborative Practice. This document, it is hoped, will help shape the conversation around interprofessional education. The original Core Competencies was published in 2011 and can be found on the IPEC's website (ipecollaborative.org). For the social work field specifically, the hope is not to reinvent the wheel when it comes to collaboration but rather to further it. "The 2013 Annual Survey of Social Work Education Programs revealed that nearly 28% of baccalaureate and 43% of master's programs are already engaged in interprofessional education through classroom and field-based initiatives," Coffey says. "The numbers have almost surely grown since then. CSWE would like to be able to provide program and curricular resources to support this growth, as well as venues in which programs can share best practices." One way for those numbers to grow is revision of program curriculum to include more interprofessional aspects. Coffey expects to see this in the near future, noting that it will be necessary for certain already set social work goals to be achieved. "The Grand Challenge Initiative of the American Association of Social Work and Social Welfare has identified 12 grand challenges as a call to action for social work to be involved in tackling our nation's toughest social problems. We will absolutely need to work in interprofessional collaborative ways in order to do this," she says. Exactly how these goals will be achieved and how curriculums will evolve to meet this renewed expectation of collaboration is unknown to date. But regardless, Coffey is excited—about the ways in which social work continues to advocate for itself as a profession and about the further inclusion of it within health care and other settings. "There is a growing recognition of the value that social workers bring to health care, as well as other areas of practice including education, criminal justice, housing, and the political system," Coffey says. "Claiming our place within interprofessional education and collaborative practice is a first and necessary step in assuming leadership roles in these spaces. This is what I would like to see social work education moving towards more decisively—preparing students to assume those leadership roles. 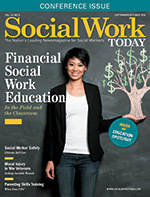 This is a fantastic moment for the social work profession."